FLOWERY BRANCH, Ga. – As the latest, costliest addition to a star-studded attack, Julio Jones still struggles to reconcile the fade route the Atlanta Falcons ran in their one-and-done 2011 postseason with the team's wealth of offensive talent. After all, with Matt Ryan throwing to Jones, Pro Bowl wideout Roddy White and future Hall of Fame tonight Tony Gonzalez – when he's not handing off to workhorse halfback Michael Turner – the promising receiver believes defensive coordinators are faced with an untenable task. "You know what I would do? Just pack up my stuff and go home," Jones said, laughing, after a training camp practice at the team's training facility last Saturday. "I mean, who are you gonna double? Tony? Roddy? Me? That's six people. What are you gonna do?" That was the vision that inspired Falcons general manager Thomas Dimitroff to swing one of the biggest draft day blockbusters of recent years, dealing five picks, including a pair of first-rounders, to the Cleveland Browns to trade up to land Jones with the sixth overall selection of the 2011 draft. Yet the injection of Jones, a fast and ferocious receiver with serious playmaking potential, into an already productive offense never went as smoothly as planned during his rookie season, one which ended in the most inglorious fashion imaginable. After taking a 2-0 lead early in the second quarter of their first-round playoff clash with the New York Giants last January, the Falcons allowed 24 consecutive points while scoring none of their own. The offensive shutout represented the biggest embarrassment of the trio of lopsided playoff defeats they've experienced since the arrival of Dimitroff, coach Mike Smith and Ryan reshaped the franchise following the 2007 season. Still looking for its first playoff victory during that span, Atlanta has been bounced by conference champions on each occasion, with the past two postseason foes (the 2010 Green Bay Packers and last season's Giants) going on to win the Super Bowl. The Falcons believe they're capable of ascending to that level, but if Matty Ice and his receivers stay frigid under the warm glare of the playoff spotlight, it won't be opposing coaches who'll be told to start packing. The Falcons do, in fact, have a pair of new coordinators for 2012, with Dirk Koetter taking over the offense and Mike Nolan now presiding over the defense. It's unclear whether the departure of their predecessors was considered a fortuitous development by Smith, who might have decided to part ways with offensive coordinator Mike Mularkey (now the Jaguars' head coach) or defensive coordinator Brian VanGorder (who'll fill the same role at Auburn) had they not bolted within days of the defeat to the Giants. In what amounted to a de facto trade with the Jags, Koetter, Jacksonville's offensive coordinator for the past five seasons, will now take a shot at doing what Mularkey couldn't in 2011: Coalesce a host of skilled players into a consistently cohesive unit. "It was kind of difficult because we didn't have any rhythm to the offense," recalls White, who caught 100 passes for 1,296 yards and eight touchdowns in 2011 to earn his fourth consecutive Pro Bowl selection. "We were trying to do this, experiment with this, see what Julio could do and what he can't do. It took a while." The Falcons had the league's 10th-ranked offense in 2011 and averaged more than 25 points per game, but they still seemed oddly out of sync at key times. One persistent criticism of Mularkey was that Atlanta tended to look better using a no-huddle attack, with Ryan calling the plays, than when it ran a conventional attack. Ryan's comfort level in the no-huddle has certainly been hammered home to Koetter – "I think everybody's kind of told him, including myself," Ryan says, laughing – which means it will still be employed liberally. And when Koetter calls the plays, look for the Falcons to take more chances than they did in 2011. "He's more aggressive," White says, comparing Koetter to Mularkey. "He's not gun-shy whatsoever. He will have no bullets left in the chamber at the end of the game, I can tell you that. He has so much confidence in all of us as playmakers – he just dials 'em up and he expects us to make plays." Ryan, for one, has prepared himself to do some serious slinging in 2012. He hit the weight room hard over the offseason in a concerted effort to get stronger, with increased durability and arm strength as his goals. "He's a lot stronger than he was last year," White says of Ryan. "He's got a lot more zip on the ball. He just wants to be able to push the ball downfield, get it deep." Ryan, who played in the Pro Bowl following the 2010 season, says he is driven by past playoff disappointments but is careful not to look ahead to his next postseason test. "If you're concentrating on what you're gonna do in the playoffs all the time," Ryan says, "you'll probably be at home watching the playoffs. You have to do the little things to get there and give yourself that chance. And when we do get back, if we do, we have to take better advantage of it." Says White: I just feel like when we get into playoff games nobody plays their best football. It's kind of crazy. We're all kind of tentative, not playing fast and up to our expectations, not doing stuff that we do in the regular season. I just think we're too anxious, that everybody's got to relax and just go play football. We're too talented on offense to come up with zero." Smith began breaking down his preparation for the three playoff defeats during his tenure a day after the Giants game, looking for ways to tweak the schedule and overall approach in the future. One thing the coach says he won't do is start getting conservative on fourth down. The Falcons were stopped on a pair of fourth-and-short plays against the Giants, a continuation that had plagued them throughout the season. "We're gonna be aggressive," Smith says. "I feel very confident in the statistics that say what you should and shouldn't do, and I have a whole lot of confidence in our players. And heck, I heard some boos the other night on the first drive of the [second] preseason game [a 24-19 defeat to the Cincinnati Bengals in the Georgia Dome] when I didn't go for it on fourth-and-1 [from the Cinci 46]." 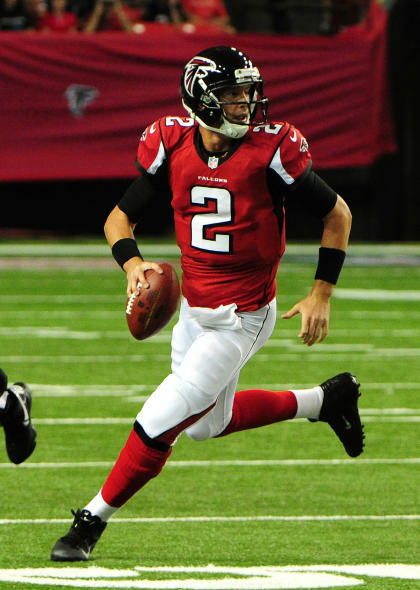 With Turner, a two-time Pro Bowl selection who turned 30 in February, perhaps starting to feel the effect of having carried 300-plus times in three of his four seasons with the Falcons, it's likely Koetter will compensate by shifting some of the responsibility to Ryan. And why not? With an elusive slot receiver in Harry Douglas – "He gets lost in the fray," Ryan says, "but he's a super, super smart guy that's kind of a crutch for me in the no-huddle" – and perhaps the NFL's most potent pair of outside receivers, it's logical to expect an air show in 2012 and beyond. Jones, who missed four games in the middle of the season with a hamstring injury, caught 54 passes for 959 yards and eight touchdowns as a rookie – and the Falcons are counting on much more in 2012. "I think the guy can catch 80 sleepwalking," says Falcons receivers coach Terry Robiskie, whose tough love helped turn White from a perceived bust into a star upon Ryan's arrival. "We'll have some new wrinkles, a couple of things designed to get it in Julio's hands faster, so he can get it and go." Jones has shed his dreadlocks and his disquieting practice of laying out for balls in practice, a sign of the former Alabama star's hyper-competitive nature. He loves being challenged on the line of scrimmage by physical cornerbacks, saying, "Yeah, it's like fighting, man. I mean, you ain't gonna let nobody whup you. I don't care who is across from me. It's just my mentality. You can write that down." Robiskie believes that Jones, who stands 6-foot-3 and weighs 220, needs to play faster than he did as a rookie. "I've told him, 'Quit break-dancing,'" Robiskie says. "He just needs to get off the ball and go, and not do much thinking. 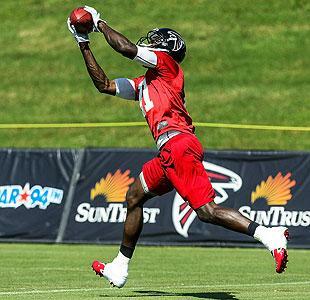 Julio is a massive man. When he runs, it's like being at a morning workout with horses in Kentucky – you can literally close your eyes and hear him running with power. He needs to stop thinking and start running as soon as the ball is snapped." With secondaries forced to choose between sliding toward one side or the other, somebody should be running free much of the time. For that reason, Ryan envisions Jones joining White among the NFL's receiving leaders in 2012 – and into what should be a scary future together. "I think they both have a chance to have big seasons," Ryan says. "That's the goal, to become an offense that makes people scratch their head, because they don't know how to defend us. I think we're capable of being that kind of team." If they can do that in the postseason, at long last, maybe the Falcons won't be the team forced to pack up and go home.